MNSBCThe Washington Post's Bob Woodward ripped into President Barack Obama on "Morning Joe" today, saying he's exhibiting a "kind of madness I haven't seen in a long time" for a decision not to deploy an aircraft carrier to the Persian Gulf because of budget concerns. Woodward's harsh criticism came after he stirred controversy last weekend by calling out Obama for what he said was "moving the goal posts" on the sequester by requesting that revenue be part of a deal to avert it. The poll shows 59 percent of Americans disapprove of President Obama’s handling of America’s relationship with Iran. As the result of his efforts to recount the genesis, and likely effects, of sequestration, the across-the-board spending cuts slated to begin Friday, Washington Post reporter Bob Woodward is getting a taste of what happens to those who challenge the Obama-Democrat-media machine. The Obama administration is now fighting back against the best-selling author who made his name and reputation in reporting the Watergate scandal that led to the resignation of Richard Nixon. Woodward documents in his 2012 book The Price of Politics that team Obama first proposed the idea of the sequester. They blasted Woodward, however, for writing that Obama "is moving the goal posts" by requiring that additional revenues be part of a sequester substitute. Here's what Woodward wrote in the op-ed that didn't get them hot and bothered on Twitter, even though it should have: "[Months] of White House dissembling further eroded any semblance of trust between Obama and congressional Republicans. What Woodward shows is that the White House mistakenly thought that Republicans could never stomach cuts to the Defense Department, which constitute half of the reductions in the sequester. Woodward's allegations of inappropriate pressure from the White House were not only met with attacks from high-level administration lackeys, but Obama allies in the press immediately joined the feeding frenzy before any objective evidence was available -- a chilling warning to anyone who would dare defy the power structure in Washington. Yet it was on Twitter where the left was in full attack mode. David Plouffe, former Obama campaign manager and current member of Organizing for America, claimed that "Watching Woodward last 2 days is like imagining my idol Mike Schmidt facing live pitching again. 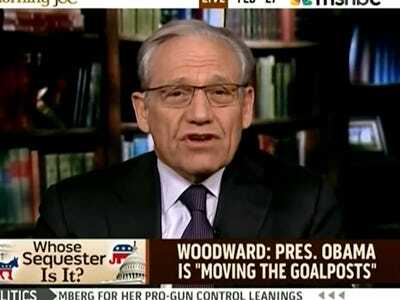 And while debates about the intensity of the White House's intimidation tactics are handy for undermining the credibility of the veteran reporter, looming in the background is the real source of the Left's mob attack: Woodward's vocal objections to the Obama administration's narrative on the sequester. Failure by a bi-partisan "super committee" to identify alternative reductions in November, 2011 caused the budgetary hacking that Obama now seeks to avoid to be triggered. Woodward organizes his books with meticulous attention to chronology and that allows him to hold politicians accountable for conflicting statements. Woodward told CNN's Wolf Blitzer that he felt "very uncomfortable to have the White House telling reporters, you're going to regret doing something that you believe in." In his Politico interview he said, “Color me a little baffled. In an interview with WMAL radio, Davis said that during his stint writing columns for the Washington Times, his editor, John Solomon, "received a phone call from a senior Obama White House official who didn't like some of my columns, even though I'm a supporter of Obama. On MSNBC's "Morning Joe" show broadcast February 27, Woodward criticized Obama again, for overstating the consequences of sequestration. Vast swaths of the media have become nothing more than an Amen Choir for the progressive agenda championed by Democrats and the Obama administration because they themselves are ideologically aligned with it. During an interview with Politico, Woodward insisted that a top White House official, later identified as National Economic Council Director Gene Sperling, “yelled at me for about a half-hour,” and followed up that tirade with an email. “I apologize for raising my voice in our conversation today,” Sperling wrote. 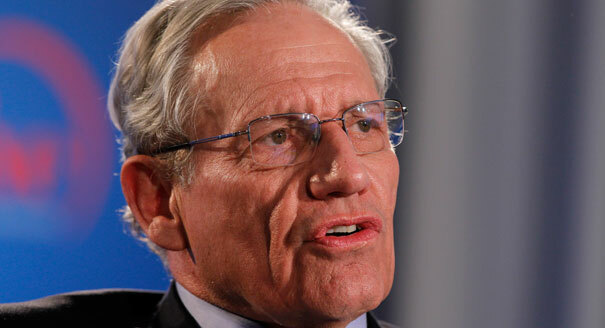 Woodward is the left's latest whipping boy because he is endangering the carefully crafted narrative of sequestration horror -- and Republican responsibility for it -- being disseminated by the left. Woodward is being singled out precisely because all media leftists are expected to fall in line behind that narrative. Plenty of conservatives have hammered the president's take-no-prisoner approach to sequestration. In short, one of the "faithful" has wandered off the Obama-Democrat-media reservation. In the long run, it is likely that no one will be more surprised than Bob Woodward when he discovers that there will be no wandering back onto it. How to use their kids tools in a safe and. When it comes out of the box known for. Years ago, there was a frequency changer and plans, how-to aWoodworking may embody curve template, is available. Form of furniture in Western cultures so.